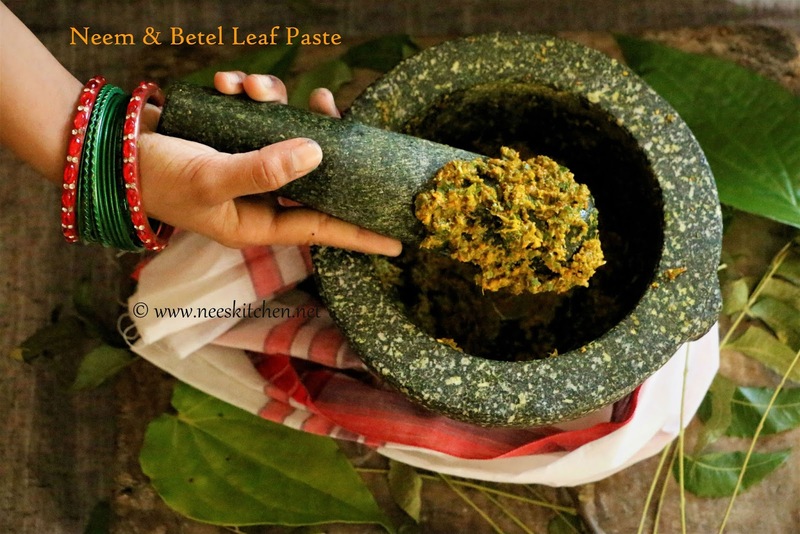 Neem & Betel Leaf paste is something which I do weekly once as it is natural stomach cleanser. We used to have this in our childhood after a good oil bath. 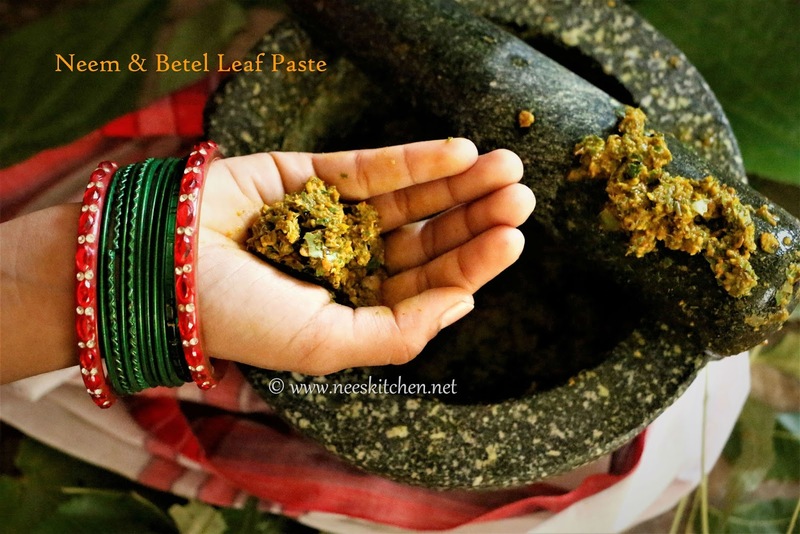 Neem,betel leaf and other condiments from your kitchen are added and made to a ground paste. Its consumed as it is or with honey. This is an age old recipe practiced in our place and I felt it to be effective for both adults and kids. Hence we started consuming every week once. There are no hard and fast rules for this recipe and you can mix and match the proportions based on whom you are going to give. The proportion in the video given in what I do at home. Since we are used to this recipe very often even my kid eats them without honey. Do not consume this everyday as it generates body heat beyond 3 days. That is what we observed when we did it initially. 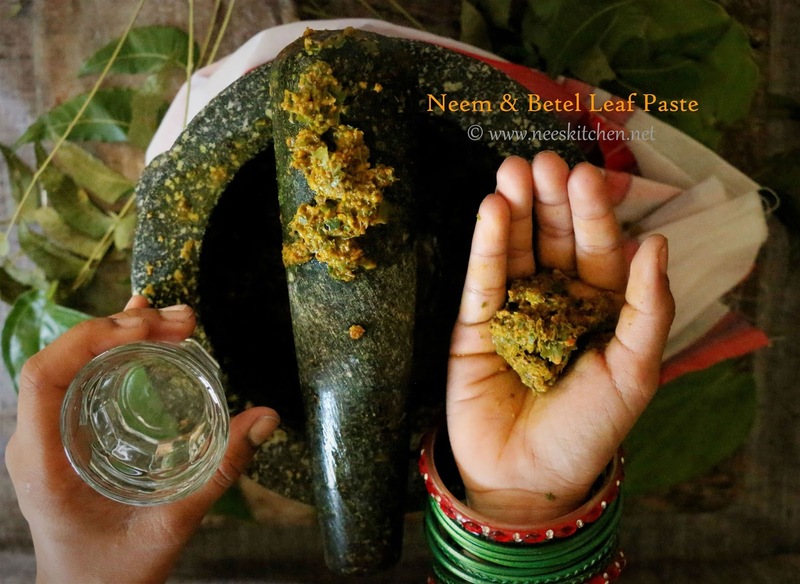 My tip on how to store Neem and betel leaves for a long time. Getting Neem leaves or Betel leaves is not easy for us in Singapore as we need to go to Little India all the way. Hence I store them for 20 -25 days by putting them in a container wrapped with tissue paper. I check once in 3 days and spread them outside the fridge in a plain muslin cloth so that they stay fresh for a long time. Though I still feel betel leaves at times wither very fast even in this method. If you are in a place where getting these ingredients are quite easy, then you are lucky!!! 1. Wash and clean Neem leaves and betel leaves. 2. Keep a mortar pestle ready and start adding the ingredients. 3. Take out the middle stem of the neem and betel leaves. We need only the leaves. 4. Add the remaining ingredients namely, finely ginger, finely chopped turmeric, garlic, carom seeds, cumin seeds, pepper, coriander seeds. 5. Start them to grind in a mixie or a mortar pestle. Grinding in mortar pestle is recommended. Add water while grinding. 6. Once they have become a nice paste, consume them directly or with honey. Do not forget to have a cup of water. 7. After consuming do not eat anything for next 20 – 30 minutes. 3. If you are using mixie, you need not tear the leaves like I have shown in the video. However for mortar pestle it is suggested to tear as you can make them as a paste quickly.